Hibiki is apparently a famous Japanese whiskey which is renowned for being especially good – as I am not a whiskey taster nor I have tried the Hibiki, I can’t elaborate much more than that. 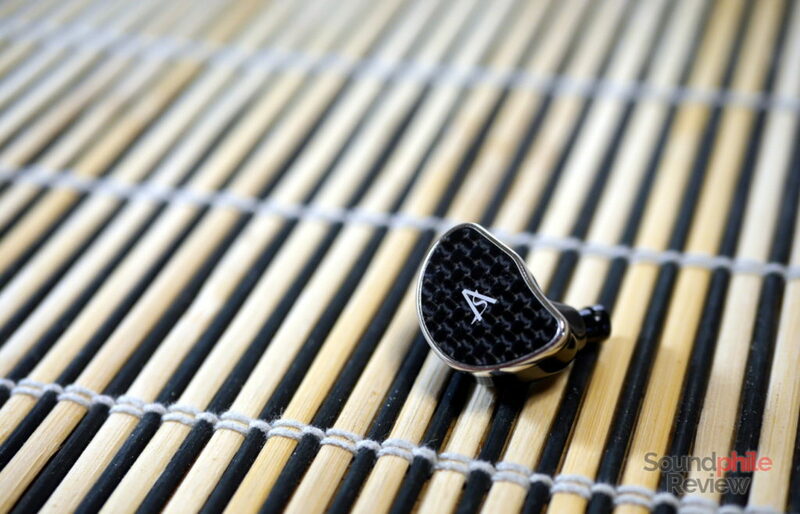 But I can elaborate more on the Shozy Hibiki Mk2, the new in-ear headphones by Shozy in collaboration with the Singaporean company AAW (Advanced AcousticWerkes). They are the second instalment in the Hibiki series, as the name suggests, and they come with a slightly different design. They have a single dynamic driver to take care of the whole acoustic spectrum – with good results. Disclaimer: this unit is a complimentary sample Linsoul sent me. They sell the Hibiki Mk2 on Amazon at $69 and AliExpress at $65. The box has a foam padding that holds the earphones, the cable and two additional pairs of silicone eartips (one is already installed on the earphones). There’s also a manual with an explanation of how to wear the Hibiki Mk2 and their specifications. This is the second child of the collaboration between Shozy and AAW and it keeps most of the aesthetic choices the two made with their first product: the shape is similar, if not identical, and there’s the same shiny silver frame around the faceplate. The Shozy Hibiki Mk2 ditch the iconic hibiki name handwritten on the predecessor’s faceplate in favour of an “AS” logo, which appears to be the initials of “AAW” and “Shozy” combined. They keep the same carbon fibre texture, however, which surely gives them a unique look. The rest of the housings is made of shiny black plastic with the channel printed in white. 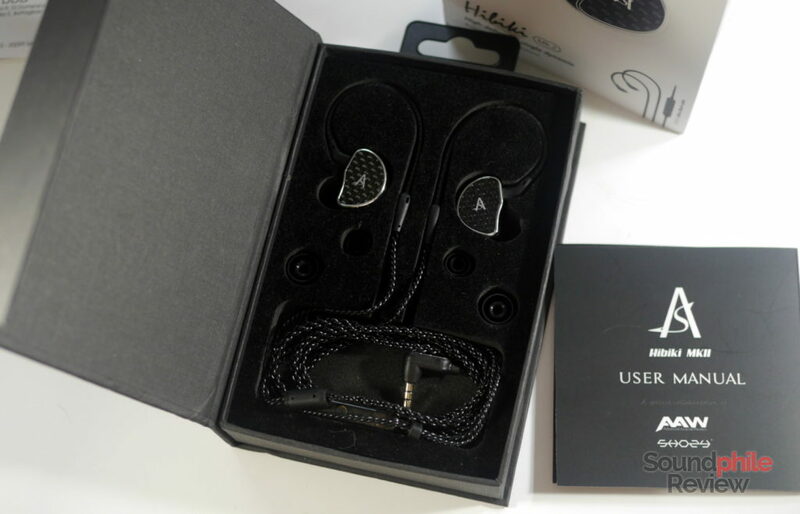 The earpieces are quite large overall, especially in terms of depth – though they are similar to the KZ ZS10 in shape, they are much more bulky. This leads to them being more difficult to fit into one’s ear – more on that later. Build quality is very high. The housings are made of two pieces: one is the faceplate with the silver frame, the other is the rest of the hull – since there is just one dynamic driver, there’s no need for multiple pieces in the assembly phase and everything is kept simple. Materials used are high quality and seem durable and reliable. 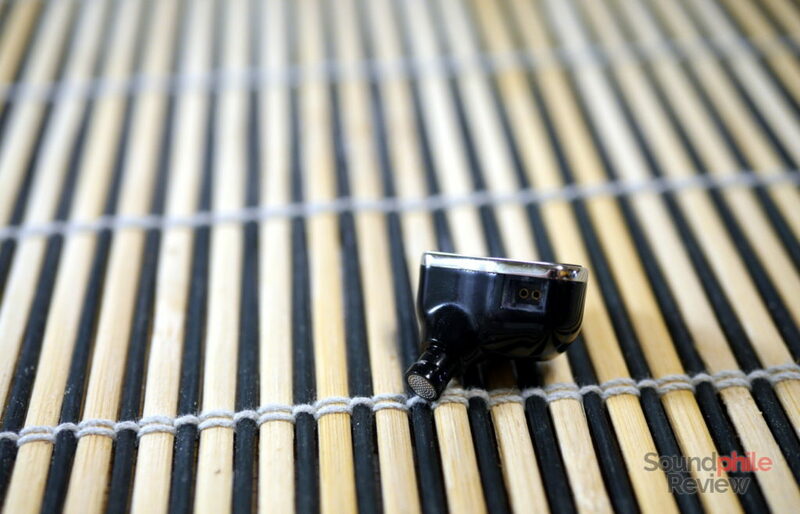 Contrary to many in-ear headphones with detachable cable in the same price range, the Shozy Hibiki Mk2 use a recessed socket for the 2-pin connector that only fits some cables. In fact, cables such as the Yinyoo 6-core copper cable or Yinyoo 8-core SPC cable are not compatible as they can’t fit in the sockets and their pins are not long enough. On the other hand, cables with a “raise” on the connector such as the AK Audio 4-core 7N copper cable work perfectly as they are made for IEMs like these. The shells are rather large and make the Shozy Hibiki Mk2 a difficult fit for those who have smaller ears. It is the bulging internal part which causes the issue, though the size alone is enough. It takes a bit of time to get the right positioning and the right fit, but after that the experience is comfortable and nice. 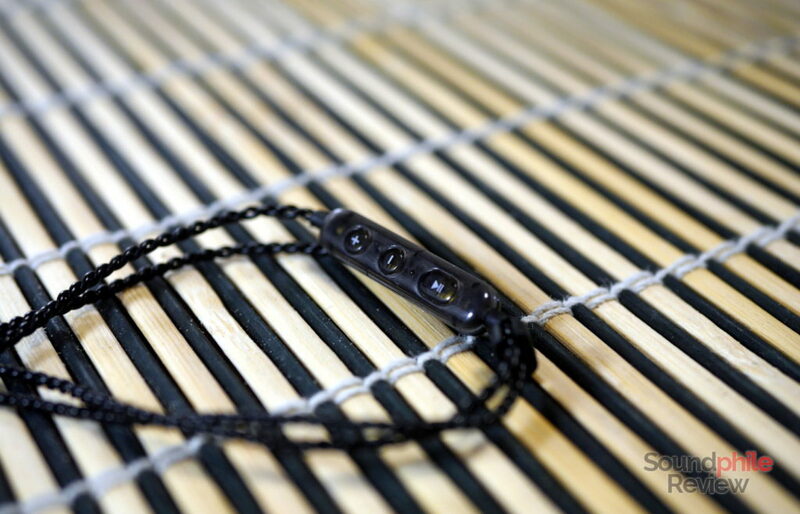 The cable that comes with the earphones has four total cores with two different styles of braiding before and after the Y split: in fact the four cores are intertwined below the split, while the two core that make each channel are just twisted. The cable seems to be resistant and well-built, though it is a bit thin between the Y split and the earphones. There’s also a remote with microphone and three buttons (play/pause, vol+, vol-, with this odd placement where play/pause is not in the middle). After breaking the earphones for ~100 hours, I tested them with the following equipment: Topping DX7, Venture Electronics RunAbout 2.0bl with Topping D30 as source and Cayin N5ii. Source files were mostly standard-res FLACs. I also used the iFi IEMatch. This is a single-driver unit, but it’s one which was worked on by experts who knew what they were doing – so it is a solid product that sounds good. 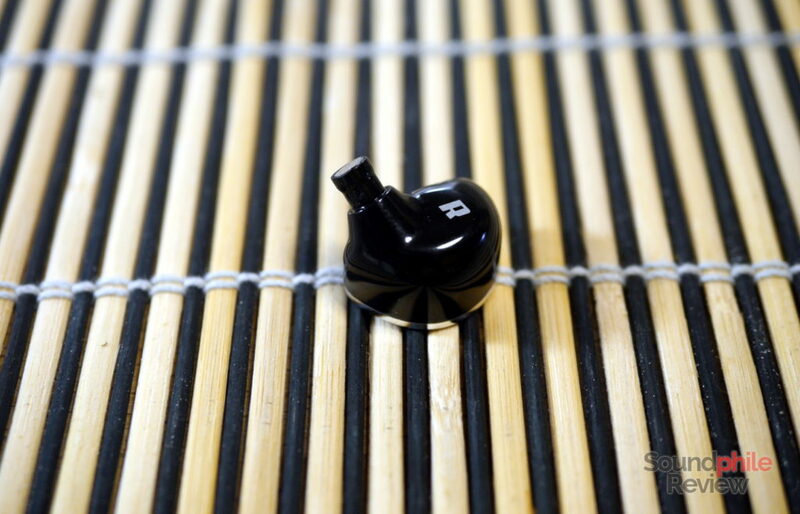 The Shozy Hibiki Mk2 puts many hybrid earphones to shame with its ability to cover most frequencies with authority. All in all, the sound signature is reasonably balanced, with a touch of emphasis on bass and a rapid roll-off in treble. It still is a signature that aims at neutrality but misses it by a slight margin due to the added warmth and lack of presence in the highs. Despite this there’s still good balance. Instrument separation is very good and I haven’t had the impression of the sound being muffled in any single occasion, though the most complex tracks can test the limits of the Hibiki Mk2 and make instruments in the background be less clear. Soundstage is decently wide, with imaging precise enough to let you locate instruments easily. The Shozy Hibiki Mk2 can reach low frequencies with ease and it is impressive how it can do so. They hold good control over bass frequencies and while they don’t represent the most minute details, they can manage different layers of sound with aptitude. Transients are fast enough for bass instruments such as drums to have an impact, but in a limited way. The quality is very high, though sometimes lows can be overbearing and overtake the lower mids. In terms of quantity, in fact, bass is a bit more abundant than necessary in the mid-bass section, with the correct amount of sub-bass (which could enjoy a bit of added presence in the lowest region). It is my impression that midrange lacks a bit of sparkle: while it is generally balanced, it lacks a bit of presence in the upper region that makes it somewhat warm and slightly boxy. Female voices are not as energetic and present as they should, while male voices are much warmer. Generally speaking, it seems like some frequencies are recessed and make instruments sound a bit distant and absent – an example is Fleetwood Mac’s Don’t Stop, where voices and guitars appear as if they were in the distance while bass is just front and center. Quantity issues aside, I find a good amount of detail in the midrange that makes it enjoyable to listen to, though not exactly rich; it has decent speed so drums and other fast transients are rendered with good involvement. Treble has decent presence in the lower area, but it lacks extension and presents a somewhat rapid roll-off, therefore it has little air and lacks sparkle. The detail is there, though it is not always easy to hear it as treble-based instruments (e.g. cymbals) are often covered by the other instruments. With a bit more treble in the mix the sound signature would have been less warm and even more balanced: adding in a bit of equalisation makes the Shozy Hibiki Mk2 open up a bit and become more enveloping and clearer. The Shozy Hibiki Mk2 are good all-rounders, but genres where treble plays an important part (e.g. jazz) or where the upper midrange is key to enjoy the music at its best (e.g. classic rock) are not served that well by the earphones’ signature, though they’re still enjoyable. Tin Audio T2: as I already wrote in the review, the Tin Audio T2 appears somehow fuller and more present in its presentation, though it has in fact less bass (and way less sub-bass). It is better balanced and it leans more towards neutrality, with better treble extension and more focus on treble. It appears better in terms of technical aspects (soundstage, imaging, instrument separation), too. TRN V80: the TRN V80’s sound is quite different from that of the Shozy Hibiki Mk2, as it has similarly prominent bass paired with more forward mids (especially in the upper region) and treble that comes as a bit emphasised. The sound signature is overall a bit V-shaped and sounds a bit aggressive. It has a similar level of detail with comparable soundstage but slightly better instrument separation. RevoNext QT3: RevoNext’s new product is V-shaped like the previous one, with recessed mids between emphasised bass and treble. It has a bump in the upper mids region that makes the mids energetic and bright – quite the opposite to the Hibiki Mk2’s. It seems to me like soundstage is wider on the QT3, and instrument separation is slightly better. The Shozy Hibiki Mk2 are a lovely IEM with a distinctive design and some personality to match – they’re well balanced and thought-out, with a warm signature that includes an impressive bass section. I feel like they don’t stand out for any specific feature, but this is just because they are good all around. They’re not excellent, but this doesn’t mean they’re not worthwhile. 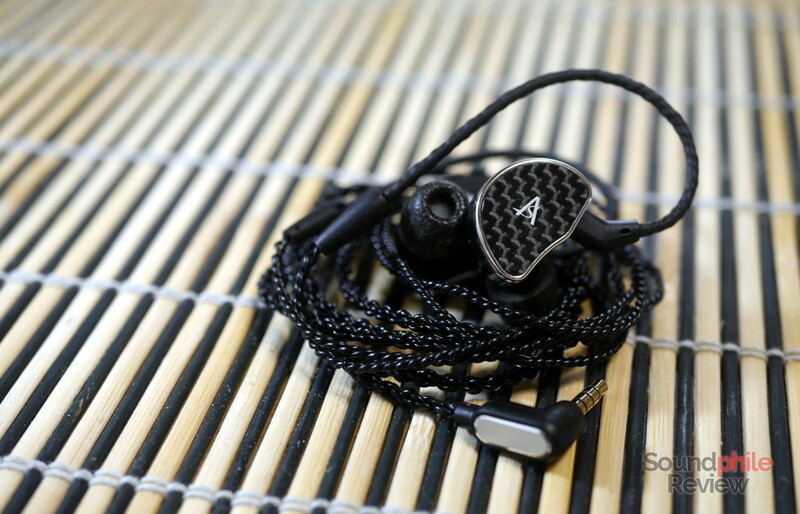 On the contrary, the Shozy Hibiki Mk2 show what a finely-tuned single dynamic driver can do in a world where many earphones under the $100 price mark are now launched with hybrid or multi-balanced armature configurations. More is not always better – sometimes less is good, too.